The thing that makes this video so hard to turn away from isn't the success. It's all the stubbornness of trying to get there. We've all been there: some weird idea about a gameplay feat gets into your head and you just can't shake it. 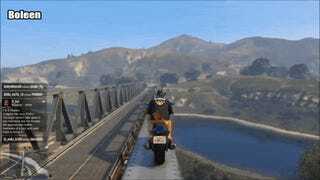 That's clearly what happened to the player in this video from the TeamPower AwesomeTeam YouTube channel, who's going to try to the narrow platform of this Los Santos bridge if it kills him. Which it does. Multiple times. Attempts #8, 12, 14 and 15 (why are you on fire) are my favorites. But when he finally lands on the other side... you just want to smoke a cigarette, don't you?